This is a cooperative project with the U.S. Fish and Wildlife Service, Ohio Division of Wildlife, and the Observatory. The Observatory is responsible for banding a sample of the herons and egrets on the island to provide information on the dispersal of these birds. 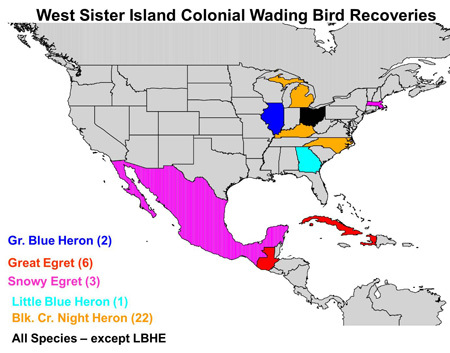 The island holds 40% of all the nesting herons and egrets in the U.S. Great Lakes. Monitoring of the population has become increasingly important due to the expansion of the Double-crested Cormorant and the resulting habitat loss. Black-crowned Night-Heron Populations have been declining on the island to well below 500 pair. They once reached a high of 1,200 pair on the island. The Black-crowned Night-Heron has been designated a bird species of concern in the Great Lakes by the USFWS. Banding recoveries have been found in Southeast Michigan, Illinois and Ohio. Around 30 recoveries have been reported from areas outside Ohio, Caribbean, and Mexico.